HP has announced that it will start taking pre-orders for the Wi-Fi only version of the HP TouchPad beginning June 19th. The 16GB model of the webOS flavored tablet will cost $499.99 while the 32GB model will cost $599.99. The actual launch of the tablet is expected to be July 1st. Later this summer, a 3G version will be made available for AT&T. The HP TouchPad is the first tablet powered by the webOS operating system that the Palo Alto based firm acquired when it bought Palm last year for $1.8 billion. The tablet features a 9.7 inch XGA display and has a 1.2GHz Qualcomm Snapdragon processor under the hood. The device will be available at retailers like Best Buy, Staples, Walmart, Office Max, Amazon.com and from HP's online store. The HP TouchPad has quite an itinerary. After its U.S. launch at the beginning of next month, the tablet heads over to the U.K., Ireland, France and Germany before heading up north to visit our Canadian friends in the middle of July. Later this year, the tablet will be available in Italy, Spain, Australia, Hong Kong, New Zealand and Singapore. Jon Rubinstein, HP's senior vp and general manager, Palm Global Business Unit says that webOS is what makes the TouchPad a compelling alternative to the competition. He says that the tablet represents only the beginning of what HP can do with the operating system. WebOS offers users of the TouchPad "next level" multitasking experience and the exclusive Touch to Share feature allows compatible webOS handsets to receive web addresses from the tablet at the click of a button. If you get a call or text message on your Palm Pre while using the tablet, you can answer or reply directly from the tablet. And unlike the Apple iPad, the TouchPad is Adobe Flash enabled which means that users get the full web experience on the tablet. Optional accessories for HP TouchPad include the HP Touchstone Charging Dock, the HP TouchPad Wireless Keyboard and the HP TouchPad Case which is sold separately. 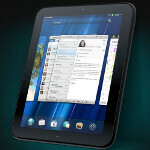 So who is planning on reserving HP's first webOS tablet? You can leave us a response in the comment box below!